A former American Idol contestant has been killed in a hit-and-run car accident in New Jersey, officials say. Alexis Cohen, 25, from Allentown, Pennsylvania, was made famous in 2008 after she directed an expletive-filled rant at the show's judges. A spokesman from the Ocean County Prosecutor's Office said an autopsy indicated she had chest, head and abdominal injuries. An investigation into the accident in Seaside Heights is under way. Cohen, who lived with her mother and was studying to become a vet when she first auditioned, was seen by viewers describing herself as marching "to the beat of a different drummer". She compared her voice to singers including Janis Joplin, Pat Benatar and Grace Slick, but the judges were left unimpressed by her performance of Jefferson Airplane's Somebody To Love. "I don't think this is the route for you, sweetheart," Simon Cowell said before comparing her to the villainous Green Goblin from Spider-Man. She later launched into a rant against Cowell saying, "Simon is a big fat bad word", before her swearing was bleeped out. Clips of her outburst became a hit on file-sharing websites and she appeared on a number of US TV shows. 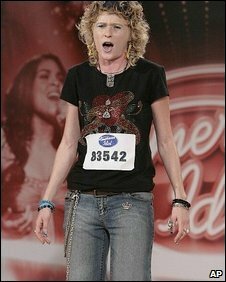 She returned to audition for American Idol in 2009 having had a makeover, but was still pronounced "horrendous" by Cowell.